WhatsApp Web/Desktop 0.2.7315: what’s new? Recently, WhatsApp submitted a new update for WhatsApp Web and Desktop, bringing the version number up to 0.2.7315. To be sure to use the latest update, please clear the cache of your browser for WhatsApp Web. As usual, let’s find out together these two new future features ..
WhatsApp is improving the reply feature, and in future the app will allow the user to privately reply to a message received in a group. There will be a new option called “Reply privately”: when selected, WhatsApp will automatically open the chat with the contact to send a message. The sent message will quote the group message. WhatsApp will allow to watch sent and received videos in a new separated window: this is the PiP feature! Note that these two features aren’t currently available because they are under development. Previous PostPrevious WhatsApp beta for Android 2.17.434, 2.17.436 and 2.17.437: what’s new? 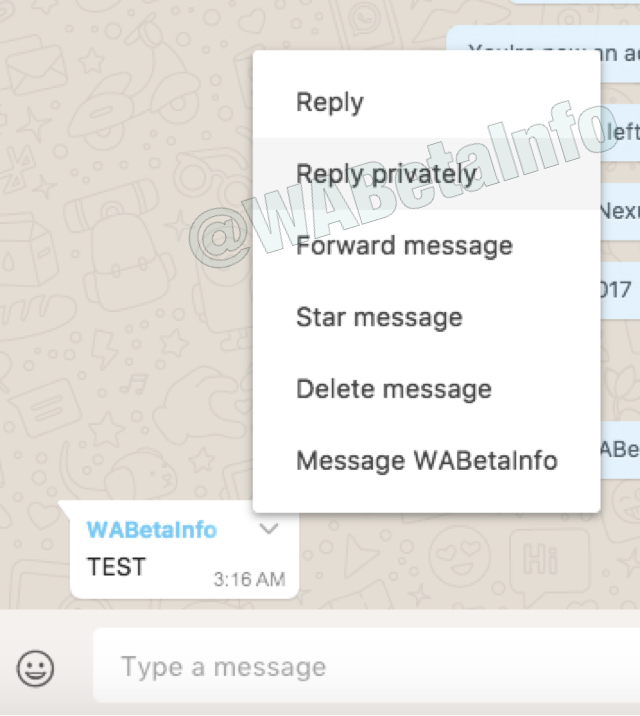 Next PostNext WhatsApp beta for Windows Phone 2.17.336 and 2.17.342: what’s new?